For the century after the Battle of Waterloo the United Kingdom was supreme upon the world's oceans. She was not unrivalled but all naval challenges were effectively dealt with. The period saw a complete transformation in naval technology. The Royal Navy adopted this technology with remarkable speed once it was shown to be practical and necessary. Sailors on the stern of the battleship HMS Illustrious, 1890's The main priority was keeping a battlefleet large enough to deal with any potential opponents; Britain aimed to have as many as battleships as the two other most powerful navies. At the start of this period it consisted of sailing ships but these were much more powerful than those of Nelson's day. The development of the screw propeller allowed the direct application of steam power to the battlefleet. The first new steam battleship, HMS Agamemnon, was ordered in 1849. The Crimean War of 1854-1856 proved the value of iron armour and France hoped to gain an advantage over Britain by putting armour on her new ships of the line. In response, Britain commissioned HMS Warrior in 1861, a bigger and better 'ironclad', built entirely of iron. It was quickly decided to replace all wooden ships with ironclads. Until the late 1880s, technical progress was such that there was confusion as to the best design. As armour got thicker and guns bigger, smaller numbers of guns were carried in centre batteries. Bigger guns were mounted in revolving turrets but it was difficult to combine these with the sails required due to uneconomical steam engines and limited coal supplies. Armour was at times ahead of gun power and this encouraged ramming tactics; strengthened ram bows resulted in some serious peacetime accidents. In the 1890s designs were standardised. Steel was used for armour and in ship construction. The term 'Ironclad' was replaced by 'battleship'. A battleship usually had two big guns at either end and a battery of quick firing 102mm guns along the sides. Steel armour also allowed the construction of large armoured cruisers the size of battleships but faster and arguably more powerful. Britain was forced to build them to defend her trade routes. Between 1815-1914 shore bombardment was the predominant mode of naval warfare. Major actions engagements took place at Algiers in 1815, Acre in 1840 , during the Crimean War in the 1850s and against Alexandria in 1882. Nowhere was the offensive power of the Royal Navy more visible than at Sweaborg in the Gulf of Finland in 1855; the bombardment lasted non-stop for 3½ days using mortar-vessels, gunboats and rocket launches destroying the enemy positions with no allied losses. HM torpedo boat destroyer Porcupine The first 'torpedoes', what we would now call mines, were encountered by the Royal Navy during the Crimean War when the paddle steamers HMS Merlin and HMS Firefly were damaged. During the 1860s an engineer, Robert Whitehead, developed an air driven mechanical 'fish' device capable of delivering an underwater charge a few hundred yards, a 'locomotive torpedo'. In 1877 the frigate HMS Shah fired the navy's first torpedo in action against the rebel Peruvian ironclad Huascar. It was too slow to hit the target but demonstrated the Admiralty's interest in this new weapon. The Russian city of Sebastopol seen from the deck of HMS Sidon during the Crimean War (Royal Naval Museum) In the 1880s many nations built small and fast torpedo boats intending to close the enemy fleet to effective range to launch their weapons. 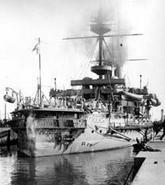 To counter this threat Britain built heavily armed torpedo boat destroyers; the first Havock and Hornet entered service in 1894. Better torpedoes plus developments in batteries and internal combustion engines also made submarines practical. The design of an Irish-American called Holland was adopted by the Admiralty in 1900. Over the next ten years over seventy submarines were built. The performance of torpedoes was revolutionised by gyroscopes and hot air engines; British torpedoes in 1909-10 could run for 4,500 metres at 35 knots. Sir John Fisher became First Sea Lord in 1904 and in the next six years led major reform throughout the Royal Navy. By 1905 increasing torpedo ranges were forcing guns to be fired at longer and longer ranges. Improvements in the aiming and firing of big guns allowed the use of their superior striking power. Fisher thought that only by exploiting revolutionary technology could Britain maintain her maritime security and the all-big-gun battleship HMS Dreadnought was the result. Mixed armament battleships became obsolete and the rest of the world's naval programmes thrown into confusion. HMS Dreadnought at sea (Royal Naval Museum) Fisher also ordered the scrapping of many old vessels, ships in the reserve were made more ready for war and the fleet was concentrated in home waters to meet the German challenge. Fisher's innovative policies were a key factor in allowing Britain to win the naval race before the First World War. Officers and men of the Victorian Navy (Royal Naval Museum) Conditions on board ship became more humane too. Instead of being seamen employed casually for a commission and then paid off, sailors became members of a permanent, uniformed military service. Both officers and men trained to cope with the new technologies. New establishments were founded to teach gunnery and torpedo work and officer training and education began to be carried out at Dartmouth and Greenwich. By 1914 the Royal Navy was recognisable as the institution we know today. D.K. Brown, Warrior to Dreadnought (London, 1997). A.D. Lambert, The Last Sailing Battlefleet: Maintaining Naval Mastery 1815-1850 (London 1991). A.D. Lambert, "The Shield of Empire", D.K. Brown, "Wood, Sails and Cannonballs to Steel, Steam and Shells" and J. Winton "Life and Education in a Technically Evolving Navy""in J.R. Hill (Ed), The Oxford Illustrated History of the Royal Navy (Oxford, 1995).